Good morning, dear friends! Today we are posting the last recipe before our short holiday break. We will have no internet access, so we will not be able to answer your mails, comments, questions. So wait until we come back! The pregnancy makes me lazy, hot weather influences my mood more than it used to and in general I feel lack of energy. So this vacation is gonna be real simple, it will involve no wandering around, just a nice room on the beach, swimming, reading, admiring nature’s utter beauty and of course good eats! Let’s move on to our recipe. Hot days deter me from eating soups with legumes, so I cook them as balls, burgers, salads or hummus. Today we are making chickpeas al pesto with bulgur, cherry tomatoes and cucumber. A healthy wholesome meal or a filling salad. 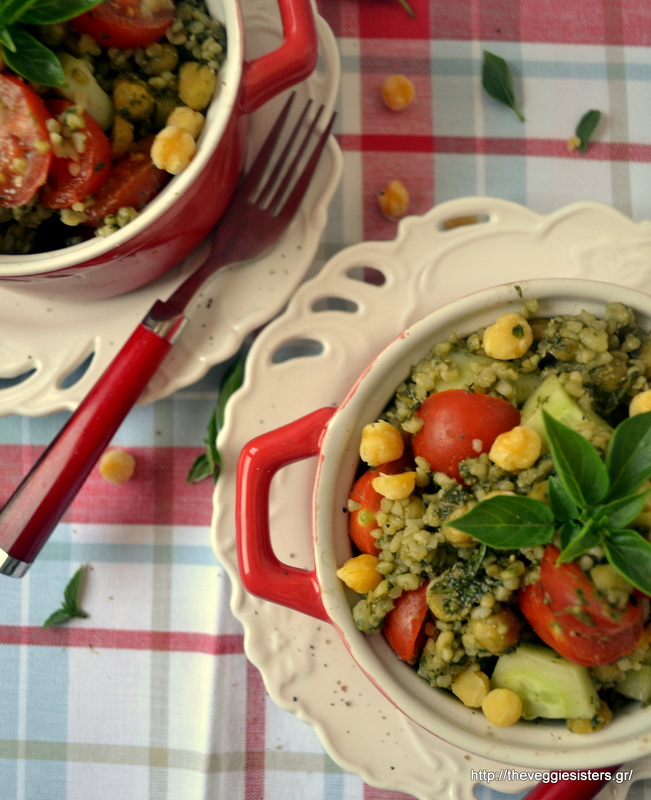 Pesto makes this dish really flavorful, the veggies make it refreshing and the combo chickpeas+bulgur gives you high quality protein. It is a balanced meal packed with nutrients. The quantities I am giving you for the pesto sauce make more than you will need. Store the rest in the fridge. I used the rest to make a spaghetti al pesto (1/2kg). Have a lovely week and take care of yourselves! We will be back in a few days! In a blender pulse basil. Then add the rest of the ingredients except for the water. Pour it in the end so the sauce gets thinner. You will use 5 Tbsp of it. The rest store it in a jar and cover the surface with olive oil. Keeps well in the fridge. 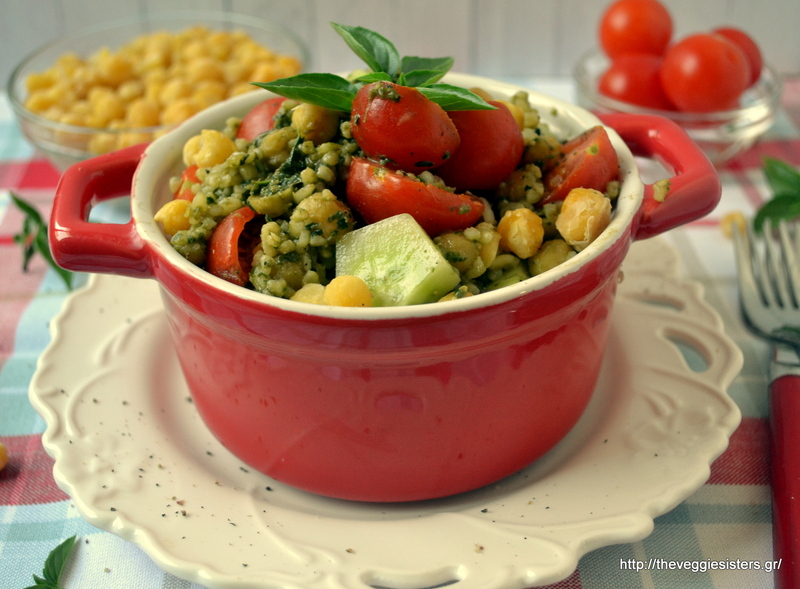 In a bowl combine chickpeas, bulgur with 3Tbsp pesto. Then add cucumber and tomatoes and 2Tbsp pesto. Mix until well combined. Serve in two bowls or dishes. Enjoy! 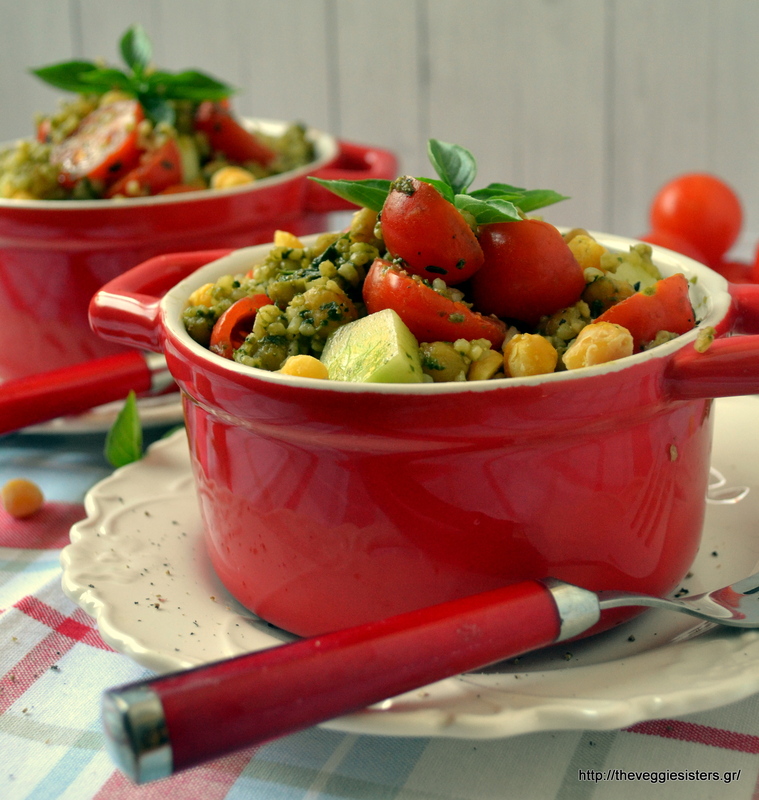 Share the post "Pesto chickpeas with bulgur and cherry tomatoes"